Notes: Based on the manga by Misato Hisa, which is ongoing as of April 2014. While most of the historical figures in this series are fairly well-known (or at least have English-language Wikipedia entries), it took some digging to determine who "Cyx" is supposed to be. The name is a cyrillic spelling of Suho, the legendary inventor of the morin khuur (a Mongolian instrument strongly associated with that nation's culture). This has relatively little to do with the character's role in the series, however. Shio Ogura, a Japanese high school student, is visiting Taiwan on a school trip when her group is suddenly attacked by monsters, identified as aliens called "Evolutionary Invasion Objects" that mimic extinct organisms. Agents known as "E-Gene Holders" from the government agency DOGOO arrive soon after, wielding weapons that infuse their bearers with the spirits of historical figures (whose names the agents go by). Shio is revealed to also be an E-Gene Holder: the soul of Oda Nobunaga awakens when she tries to rescue a friend, and she subsequently becomes involved in the war effort to stop the EIOs, now known as "Nobunagun". Oda Nobunaga might as well be the King Arthur of Japan, and just as that character has by now been subjected to parodic and satirical treatments (Monty Python and The Holy Grail, anyone?) it was only a matter of time before Japan's equivalent met the same fate. Nobunagun isn't exactly a parody, but its premise is nonetheless extremely difficult to take seriously: no logical explanation for how living people can come to possess "E-Genes" somehow linking them to the spirits of historical figures is ever given, and it's clear that the fighting was meant to take center stage at the expense of an engrossing plot. This is not something I would necessarily have minded if the show had played its cards right; of the two Nobunaga-centric series that aired in Spring 2014 (the other being the more serious Nobunaga the Fool), this one initially looked to be far more fun, if in a silly and somewhat mindless way. Indeed, Nobunagun's first few episodes establish a pattern that might have allowed the show to work had it been carried through. Among the show's biggest strengths is its lead character, a somewhat introverted military otaku with an especially strong interest in tank machinery. I appreciated that Sio was given some of the benefit of the doubt that male heroes of shounen anime are given but that female characters rarely are. The show does not want us to make fun of her hobby, watching her geek out of the machinery is adorable, and the narrative neither forces her to be unrealistically over-competent nor incompetent; in addition, she behaves decisively when under pressure, a rarity among leads in these kinds of series. The action in these early episodes is well-animated and entertaining, and I felt that the decision to render the aliens as extinct organisms had the potential to make for a fun spin on Neon Genesis Evangelion's angels and anime's other examples of "mindless creatures from space". There is also a lovely character dynamic between Sio and her friend Asao, who is essentially the only one in her class who does not regard her as weird; the two find each other interesting without feeling an intense conviction to act like the other, and their scenes are dominated by shared laughter and wistfulness rather than envy, an aspect of friendship that is often overemphasized. A romantic tone exists between them that, while likely intended to be an undertone all along, would nonetheless have made for a far more satisfying love story than that which Nobunagun eventually pulls out, and my feelings about that choice reflect my ultimate feelings about the show as a whole. Nobunagun, sadly, evolves into a missed opportunity almost immediately. For one thing, it makes the crucial mistake of forgetting the absurdity of its own plot and treating certain scenes with undue seriousness, indulging in boring and meaningless technobabble for extended periods. In my view, what the series needed to do was to maintain an air of lightheartedness and artistic exaggeration, while simultaneously tying the personalities of the "E-Gene" holders to their namesakes as a way to center the show around its characters; it ultimately does neither. The identities of the other holders range from the unsurprising, such as Gandhi and Isaac Newton, to the inexplicable choices of Jack the Ripper and the downright obscure figure Cyx (whom I had to look up), but neither the achievements nor the personalities of the figures manifest themselves in their respective characters, the closest being a bizarre suit in the shape of the Leaning Tower of Pisa that "Galileo" (essentially, this show's "loli") wears in combat. Most are distinguishable only by their degree of arrogance, with Geronimo's equivalent insisting on being called "The Princess" being especially bad, or by their perverted personalities. The latter is absolutely cringe-inducing to watch; Gandhi would not be pleased to find that his "holder" makes wisecracks about the cleavage of teenage girls, and I doubt that Newton would've been pleased to have been reborn as a hypersexual, French-kissing lesbian. Indeed, this show frequently makes light of sexual harassment, an attempt at "comedy" that instead repeatedly made me uncomfortable. In one episode, Frank Capra's equivalent, who can duplicate people by taking pictures of them, dresses some clones of Sio in skimpy swimsuits (after increasing the breast size on the clones); he then proceeds to pass pictures of her out to the other soldiers as a "reward", and I just about dropped the show at that point. It's a huge waste that a series with as strong a female lead as Sio subjects her to this kind of treatment, harassment that I'd never even wish on my least favorite character. At the same time, the "romantic" angle the show attempts between her and "Jack" is absolutely joyless and mechanical in comparison to the tone of her relationship with Asao, showing that fanfiction may sometimes produce the better end result after all. Because of these failings, I had all but lost interest in the show's character dynamic by the middle, leaving only the fight scenes to carry my interest. There's unfortunately not a lot to see here, either, unless one is satisfied merely with seeing monsters cut down. Virtually no human drama exists in this series, since all of the bad guys (save one throwaway character) are mindless and their origin and nature are barely discussed. While Sio herself occasionally puts forth some interesting military tactics, Nobunagun's second half mostly just consists of episode after episode of new monsters showing up and the E-Gene holders struggling to cut down the oncoming waves fast enough. This parade of shallowness, dull speeches, and pointless fighting marches straight up to the end, which is ultimately unsatisfying not because the show never resolves itself but because there is ultimately nothing to resolve. I'm glad to be done with Nobunagun, because I don't think I could have taken much more of it. It's shallow, it's messy, and it plays up all of the wrong aspects of its story. It's at least not a complete disaster on a technical scale, for while I didn't especially like the character design, the animation and music are fine, and there are certainly some entertaining moments amidst the stream of endless battle. After a point, however, I simply didn't care about anything going on. Nobunagun is neither fun nor clever; it's simply about monsters being blown up, and it squandered its chance to have all three of those traits. Recommended Audience: This show is violent, though with a few exceptions the monsters suffer worse dismemberment than the humans. There's little fan service, but plenty of verbal innuendo (enough to make this inappropriate for children) and many scenes in which the main character is harassed for laughs. 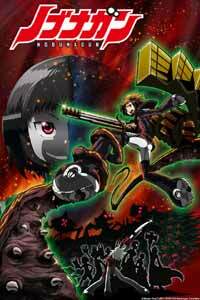 Nobunagun © 2014 HisaMasato / Earth Star Entertainment "Nobunagan Production Committee"